IDF forces reportedly entered villages in the area near the attack at the Ariel junction. Palestinian Arab media reported on Monday evening that large IDF forces raided the village of Burqin and other villages in the area near Sunday’s attack at the Ariel junction, in which Rabbi Achiad Ettinger and IDF soldier Gal Keidan were murdered. IDF forces have been operating since Sunday in cooperation with the Israel Security Agency (Shin Bet), the Border Police and the Israel Police in the pursuit of the terrorist. 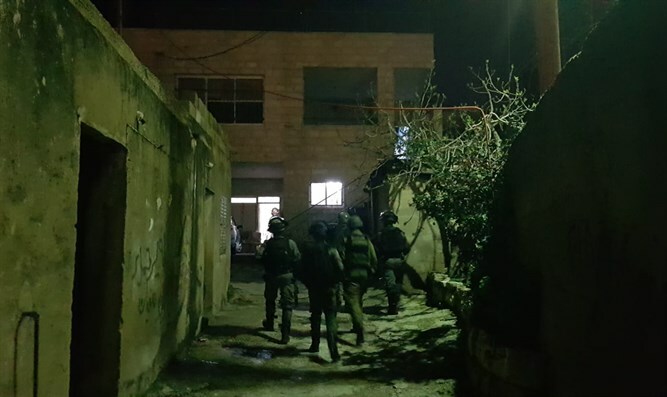 The IDF troops surveyed the terrorist's house in order to examine the possibility of its demolition. In addition, the troops conducted extensive searches and carried out security checks at the entrances and exits of the villages. Simultaneously, the forces continue to carry out operational and intelligence efforts in order to locate and apprehend the assailant. Earlier on Monday, Prime Minister and Defense Minister Binyamin Netanyahu toured the site of the terrorist attack at Ariel junction where he was briefed by GOC Central Command Maj.-Gen. Nadav Padan. Ariel Mayor Eliyahu Shaviro also joined the tour. "I send condolences to the families of IDF Sgt. Gal Keidan and Rabbi Achiad Ettinger, who succumbed to his wounds this morning, a father of 12. I have heard that they were splendid people. Our hearts are with them; the heart of the entire people is with the families,” said the Prime Minister. “We know the identity of the assailant; the IDF, ISA and the security services are in close pursuit. We know where he lives and have located his family. This morning I gave the orders to start the demolition of his home and the preparations have begun,” he stressed. “These terrorists will not uproot us from here; the complete opposite will happen. Our response is simple – 'the more they afflict them, the more they multiplied and spread,’” continued Netanyahu. In a response to a question from reporters, the Prime Minister stressed, “We are learning all of the lessons and I do not wish to delve into the operational investigation I just heard. There has been a very great tragedy here for the families. I would also like to send from here wishes for a quick recovery to the person who was wounded." “There are always actions that we are taking against the families and clans of these murderers. We did so yesterday and we will continue to do so. I would like to point out one thing: They will not uproot us from here. Our strength is great. We will apprehend them just as we have apprehended all of the recent assailants. We will demolish their homes; I already gave orders this morning to do so," he concluded.